I love my days with my little sidekick. We have a lot of fun together, and I am so glad I can stay home with him every day. I love that every day is so different and we are busy doing all sorts of fun things. Here are some highlights from my week. I spent the entire day organizing closets and getting rid of things I haven’t used in two years since moving into our house. It felt so good to make more room in the closets and see less things in our house. On Tuesday I ran 8 miles with Cullen in the stroller. This is the farthest we’ve gone, so I wasn’t sure how he would do, but thankfully he did awesome and just hung out the entire time. I made sure he was well-rested and had a snack before venturing out. I am loving my new Oiselle KG Tights. I love the 7/8th length and the detailing on the lower leg. They have a nice wide waistband with a drawstring but no pocket, which is a bummer. The lower leg has an asymmetrical cut and a zipper on the back, which is nice for getting them on and off. Wednesday I coached three Raven Run Club training group practices–the 6 a.m., 10 a.m., and 6 p.m. The training groups met at Westchester Lagoon and did a tempo workout. I ran with the 10 a.m. group and got my miles in for the day as well–double win! For those of you who live in the area, we are taking a hiatus in December with the training group but plan to start back up again after the first of the year. ‘Like’ Skinny Raven on Facebook so you can be the first to know about the next training group. They are a lot of fun, keep you accountable during the dark, cold winter months, and people of all abilities run with us! Thursday we had a pediatrician appointment for Cullen’s one year check-up. He was so infatuated with the pig calendar. His soon-to-be Uncle Nick said he would make a good defensive lineman. Thursday morning I had a 10 mile run with 8 x 100 meters on the track. I don’t know if I’ve ever done 100 meter sprints for a workout, and boy are my quads sore the day after! Today (Friday) we woke up to snow on the ground. Sad! We are lucky it held off for this long (expect for that crazy few inches we got on September 30!). I think winter is here to stay. We did venture out for a little while to Skinny Raven. 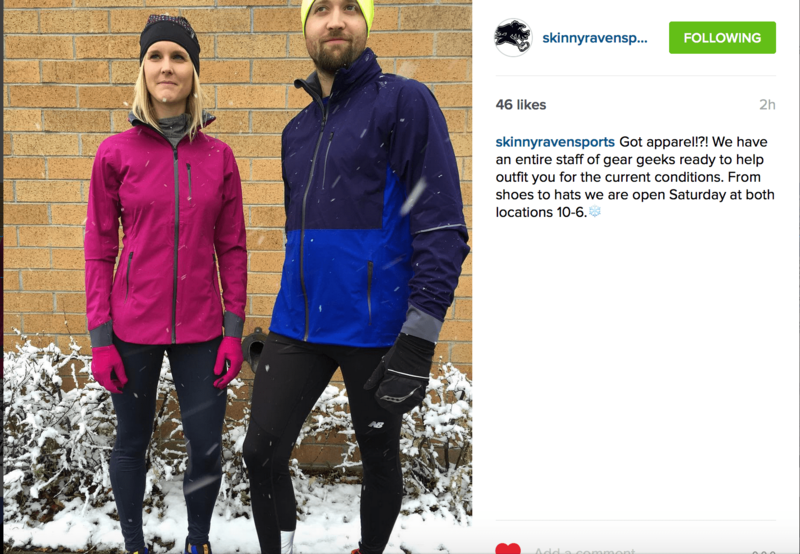 I did a video shoot that highlighted some of our winter running apparel.